The story of Calvisius begins with in the small town of Calvisano, situated between Venezia and Milano. There, you will find Agroittica Lombarda, the most prolific caviar farm in the world, producing 25 tons of eggs per year. This project of farming endangered fish in fresh water began in collaboration with the University of California: Davis and a Pacific species of White Sturgeon. 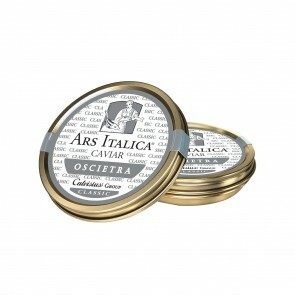 This three-pack of caviar comprises Royal, Tradition, and Siberian caviar, all sourced according to sustainable methods from the Caspian Sea to the Pacific Coast. Compare the deep and varying flavors of caviar, adding a dash of decadence to any occasion.